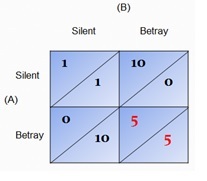 In this week’s POL1012 Introduction to Politics: Power and the State seminars, on Rational Choice theory, I ran a prisoner’s dilemma game with the students. This is something I have done for several years now but this time I wanted to make a record of what happened. Students were told that they had been arrested for a crime along with their accomplice and could not communicate with this partner in crime. 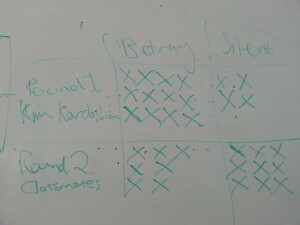 In each of the three seminar groups we played 2 rounds of the game. For the first round I gave them a name of the same celebrity (I settled on Kim Kardashian as someone they MUST have heard of) on a piece of paper. I told them that they were not allowed to show the name they had to anyone else in the class and that if they had their own name to let me know. I wanted to give them the impression that they did not all have the same name and that someone could have their name. 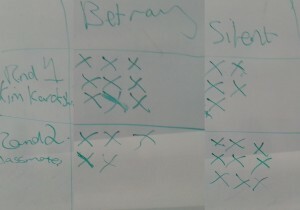 The students began to see how their perceptions of their classmates influenced their decision to betray them or stay silent. Many in the second round chose to stay silent because they had seen their partner in crime stay silent in the first round, only to find that their partner had also learnt from the first round and had completely shifted positions in the second round, leaving them feeling betrayed. 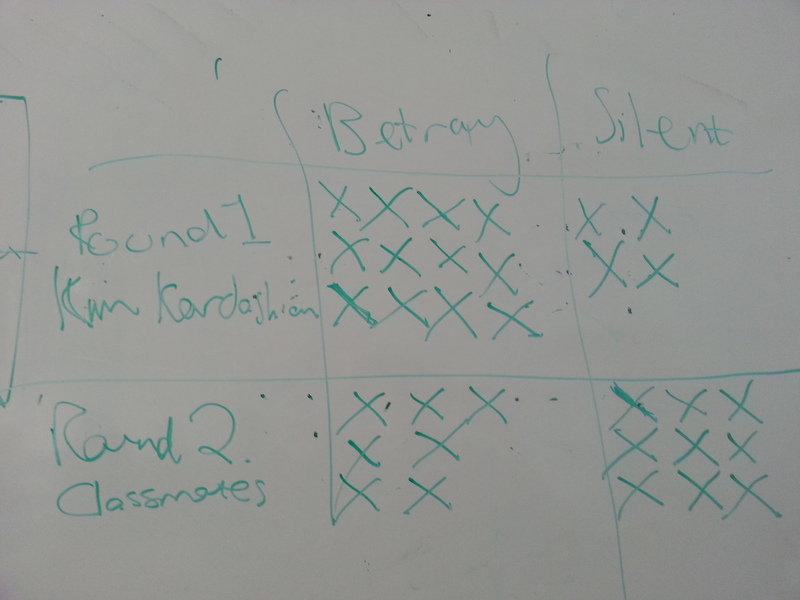 Perhaps next time I will play the two rounds without the students revealing how they have voted in the first round until after we have played the second round.. Some students spoke about how their conscience would not let them betray their partner, that they had been brought up not to “rat out” someone else or that the their partner in crime was a friend they trusted. 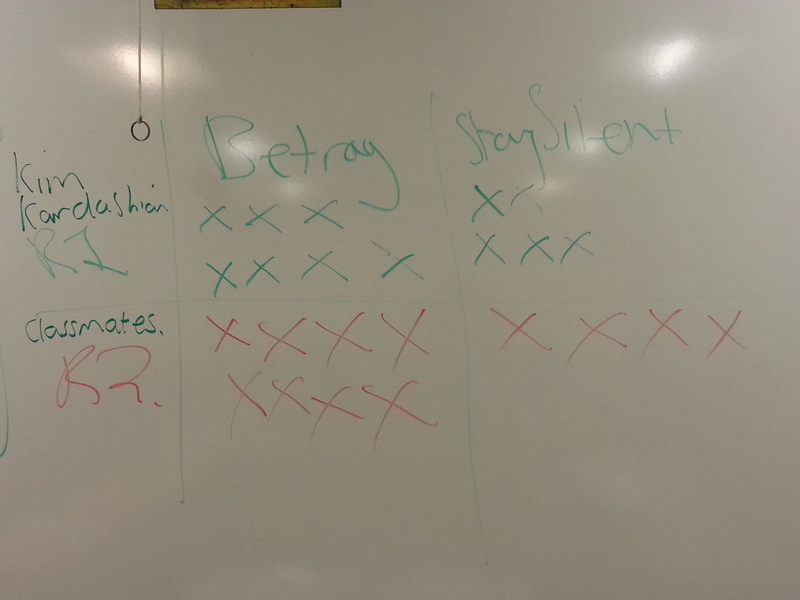 For the first round some made an assumption that the celebrity could not be trusted because of their money, while some classmates felt this was why they could be trusted. Others were resolutely rational and said that they would not risk 10 years in prison and 5 years was clearly the most rational decision to make. 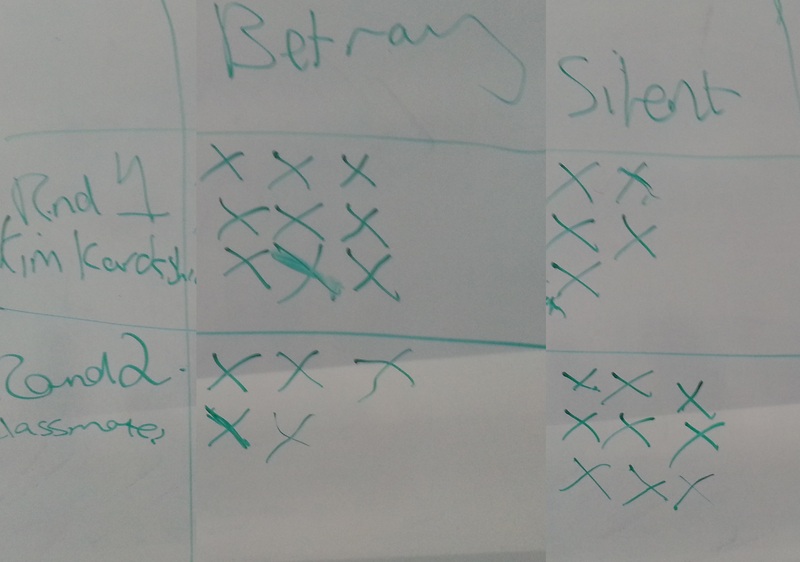 Surprisingly, among the three seminar groups the first group – just BSC Politics students – was the most rational with the majority choosing to betray their partner in crime. I had expected that the final group – with BSC Politics Economics students in it – would take the most rational stance, this was far from the case however and in the main they showed a noble sense of comradery (along with the second group of BSC Politics Sociology students)!